Mold is one of the worst things that could inhabit your car. Mold is a form of fungus that forms due to moisture and warm temperature. Since it is a fungus, it is harmful to one’s health and can cause severe allergies even death. There is one type of mold called black mold or Stachybotrys chartarum and chlorohalonata species, which are fatal even by just inhaling the spores. Be careful when leaving your car out in the open, especially if there is no roof above it. Have you ever parked your car after a night out with light booze and accidentally scraped your car on the garage door? Have you ever parked your car and then came back to it with scrupulous-looking paint on the side?Alternatively, have you ever been in a minor accident where you or another vehicle came too close to each other? There is one common effect you get from these mishaps – paint transfers or paint scuffs. Paint transfers, otherwise known as paint scuffs, result when another vehicle or another solid object such as gates or posts scratch against your car. What Happens When You Are Driving With Parking Brake On? There are rare instances that we become absent minded when we drive. We could be calculating the amount of time to reach our destination, planning our errands as we get in the car, talking to someone over the phone, or scolding one of your children. After you have driven a couple of meters, you suddenly realize something off about the way your car moves. It seems as if it is dragging. You stop and look at your rearview mirror in case you accidentally pulled something. Then you check your warning lights, gears, and --- oh, the parking brake!Admit it; this has happened to you once or twice in your driving life. It gets embarrassing when you’re supposedly the expert driver, and you have passengers. However, at the back of your mind, you are more worried about the consequences. Going for long drives would be extremely boring if you don't have music in your car. Back in the 90s and early 2000, we used to play music using the built-in stereos in our car that have tape decks and a CD player. Unfortunately, those things are already obsoleted. Although there are still cars that have CD players these days, but people like the "millennials" hardly even buy CDs anymore. The majority of us turn into our smartphones or other mobile devices for music. That being said, you will need to own the best Bluetooth car stereo should you feel the need to just bump some jams while driving away. I have here some of the best recommendations that are worth your money. I had the misfortune of needing a jumpstart because my car’s battery froze so it wouldn’t start. At that time, I was at a relative’s house, so I didn’t have my tools available. Good thing somebody had a jumper cable and I was able to give my car’s battery a boost. So, it got me thinking, what if I was in a parking lot or somewhere else and there were no other people who can help me jumpstart my car? I made a mental note of purchasing a mini jump starter for emergency cases. A mini jump starter is a very helpful emergency tool for drivers. There are certain situations wherein a car’s battery gets discharged for a number of reasons. Some of the reasons are when you start your car, and you forgot to turn on the air conditioner, radio, and lights. It could be due to extremely cold weather and your battery drained (like in my case). What I did was to research about 20 mini jump starters and tested 10 of them in order to find the best mini jump starter. 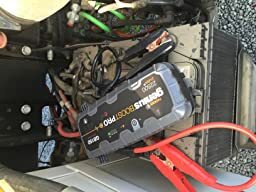 Along with my team of mechanics, we recommend the NOCO Genius Boost Pro GB150 4000 Amp 12V UltraSafe Lithium Jump Starter because it has the highest starting current, highest battery capacity, warranty, safety features, and better quality of materials. As the name suggests, two lead semiconductors emit light when activated by a suitable voltage. In the olden days, people made use of oil lamps or torches in carriages. Imagine the difficulty they experienced back then! However, in our modern world, with the addition of fueled vehicles, we have upgraded to a variety of headlamps that make driving much easier. LED headlights aren’t just a luxury accessory, but they are essential to safe driving. Most car owners try different types of LED headlights until they find one that works best for them. Even a skilled driver cannot drive well if the headlights are not visually helpful.